That's a big performance hike. An 8th-gen Core Surface Book? 08/22/2017: Updated to add details of the rumored black Surface Book based on the 8th-generation Core chips, as well as Intel’s desktop processors. 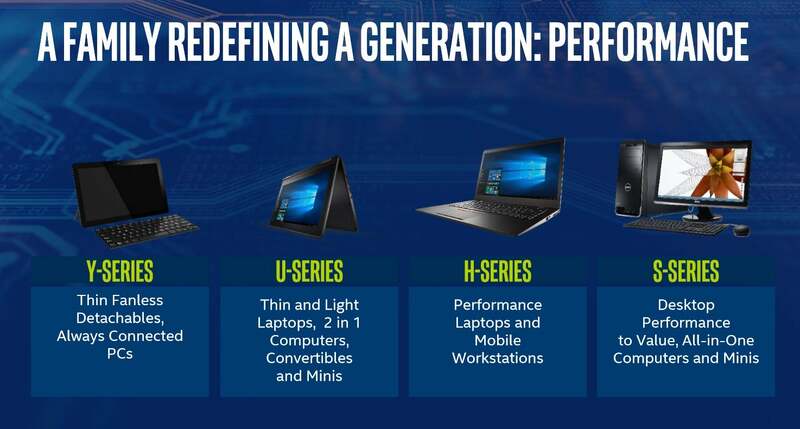 For the first time, Intel’s upcoming 8th-generation Core CPUs will feature quad-core processors aimed at ultrabooks, offering performance as much as 40 percent faster than in the previous generation, the company said. Intel hasn’t disclosed the prices of its four new 15-watt 8th-gen Core U-series chips, though the company revealed Monday how fast they’ll run: The slowest Core i5-8250U will run at 1.6GHz, with a boost clock of 3.4GHz; the fastest Core i7-8650U will run at 1.9GHz, boosting up to 4.2GHz. All four U-series chips include four cores and eight threads. PCs using the new 8th-gen Core chips should begin shipping soon, Intel said, with about 80 new system designs ready to go by the 2017 holiday season. The far more interesting story, at least for enthusiasts, is how Intel has loosened the definition of “generation,” as a slowing Moore’s Law has thrown off the company’s legendary tick-tock manufacturing process. These 8th-generation CPUs are not the upcoming Coffee Lake, as previously expected. Intel characterizes its new chips as a “Kaby Lake refresh,” referring to the current Kaby Lake chips as “prior generation” parts. (Both Kaby Lake and the "Kaby Lake refresh" chips are 14-nm parts.) Here’s another surprise: Both Coffee Lake and the upcoming 10nm Cannon Lake chips will also be part of Intel’s 8th-generation Core branding. Confused? 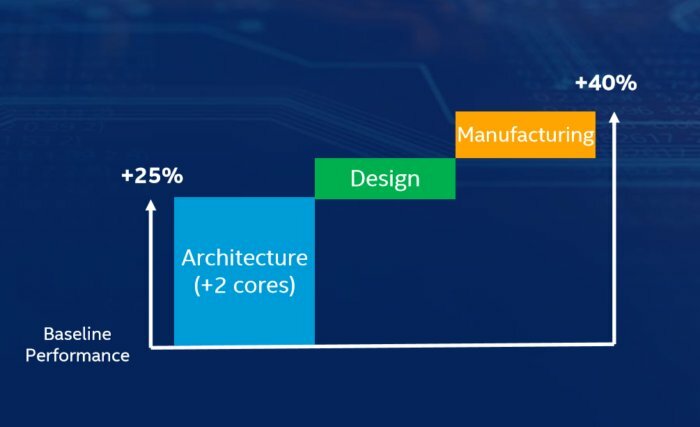 Let’s sum up: Intel’s 8th-generation Core chips will include three separate chip architectures and two process technologies, all under a single brand name. Whew! Intel’s 8th-gen Core U-series chip. What this means for you: Intel has muddied its brands before: In 2013, Intel began taking traditional P brands like Celeron and Pentium, throwing them on top of non-PC Atom chips. The current Core i9 family includes both Skylake-X and Kaby Lake-X chips. But we’ve never seen a scenario where Intel apparently has thrown branding to the wind. More than ever, savvy PC buyers and builders will have to research which upcoming parts are going into their builds. It’s important to note two key points about Intel’s new 8th-generation chips. First, that a combination of process technology, design, and optimizations yielded the 40-percent improvement. Second, that performance boost is more than double what Intel promised with the launch of the Kaby Lake chip, which saw increases of between 12 and 19 percent over the Skylake generation. Intel would have seen a 25 percent generation-to-generation boost with its 8th-gen, U-series chips simply by increasing the number of cores from two to a total of four, according to Karen Regis, director of mobile platform marketing for Intel. Tightening some of the manufacturing parameters allowed for higher clock speeds, she said. Though rival AMD hasn’t disclosed its plans for its mobile “Raven Ridge” chips, AMD’s low-power Ryzen 3 chips use four cores and (only) four threads. Applying more cores to multithreaded applications has been one way AMD claims to have a performance advantage. In several cases, Intel made its generational comparisons against the Core i7-7500U, the Kaby Lake chip launched a year ago—apparently carving out the “Kaby Lake refresh” chips as a half- or semi-generational family. PC makers PCWorld has spoken to have begun referring to the family as “Kaby Lake R.” Theoretically, that would mean that Broadwell, Skylake, Kaby Lake, Kaby Lake R, and probably Coffee Lake would all be based on 14nm technology—five separate families of parts manufactured on a single process, versus the once-traditional two. 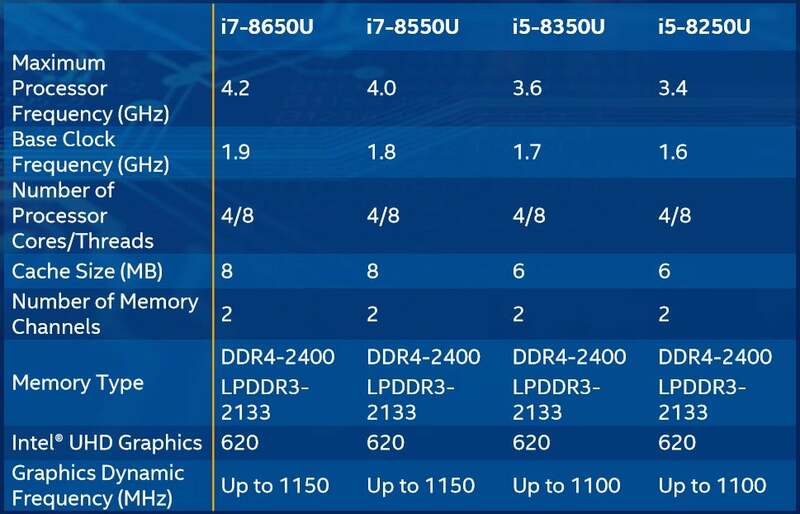 Intel derives the bulk of its 8th-gen improvements from a jump to four cores..
Officially, Intel’s new U-series chips are “based on the Kaby Lake architecture and 14nm+ process technology with additional design improvements and new optimizations,” a spokeswoman said. “We’ve redefined and reimagined what 8th-generation will mean,” Regis added. Expect the dramatic performance improvements to be Kaby Lake R’s selling point, Intel executives said. With Kaby Lake, Intel touted the architecture’s new video engine as the main selling point, rather than the modest performance increases within the chip itself. Specifically, Kaby Lake could perform hardware-based 4K HEVC encoding/decoding at 10-bit depths, or VP9 decoding. Netflix was the chief proponent of the technology, but now both Amazon and Vudu have signed on, Intel executives said. Amazon will roll out support in the fourth quarter. According to Intel, ultrabooks using the new chips should see about 10 hours of battery life, or almost 12 hours playing back YouTube. Another under-the-hood reason to buy a Kaby Lake R chip is its inclusion of Intel’s Software Guard Extensions, or SGX. According to PowerDVD, the company’s software player was the only way to play UltraHD Blu-rays as of March—and it required SGX technology. “We expect more than 90 percent of 8th-gen systems [from PC makers] will be SGX ready, allowing more 4K premium content from services,” an Intel spokesman said in an email. Games that were previously restricted by the CPU will also see a bit more freedom, according to Chris Walker, the vice president of Intel’s Client Computing Group and the general manager of the Client Mobility Group. More importantly, the new platforms support Intel’s Optane, which Intel is pitching as a technology to give hard drives SSD-like performance, as well as Thunderbolt. “With the use of Thunderbolt, you can now expand out with the new graphics docks coming to market,” Walker said. Graphics docks allow external graphics cards to be used with ultrabooks and other devices that can’t accommodate them internally. More docks will be coming to market, both from PC makers and other partners, he said. The new 8th-generation Core chips will also have enough power for the new mixed-reality solutions being developed by Acer and others, in conjunction with Microsoft. Intel even showed off a few of the concept PCs the company is building around the new 8th-generation Core chips, but declined to release public details at this time. Tweaking an established design and process has paid off in terms of availability. Consumer desktops based on the new 8th-generation Core designs will ship a bit earlier this year than they did with the 7th-generation devices, Walker said. Early next year, Intel will ship 8th-gen parts for commercial clients, both desktop and mobile, then gaming notebooks. Intel plans fanless PCs using the 4.5W Y-series near the beginning of 2018, he added. The company is also talking about “other options purpose-built for different segments,” Walker said, but the company hasn’t disclosed what exactly those will be. “It’s a fairly consistent timeframe and rollout,” Walker said. We’ll also be interested to see whether anyone other than enthusiasts and industry followers care that Intel mixes processor architectures and manufacturing technologies. One analyst thinks most everyday buyers won’t care. “Reaction to the branding strategy will be different dependent on the audience,” Patrick Moorhead, principal analyst with Moor Insights, said in an instant message. “To enterprises, gamers and enthusiasts, it won’t matter. Mainstream consumers are oblivious and really don’t pay attention to the [generations], but want to know they have the ‘fresh fish.’” Retailers and distributors will have to pay attention to that aspect, he said. 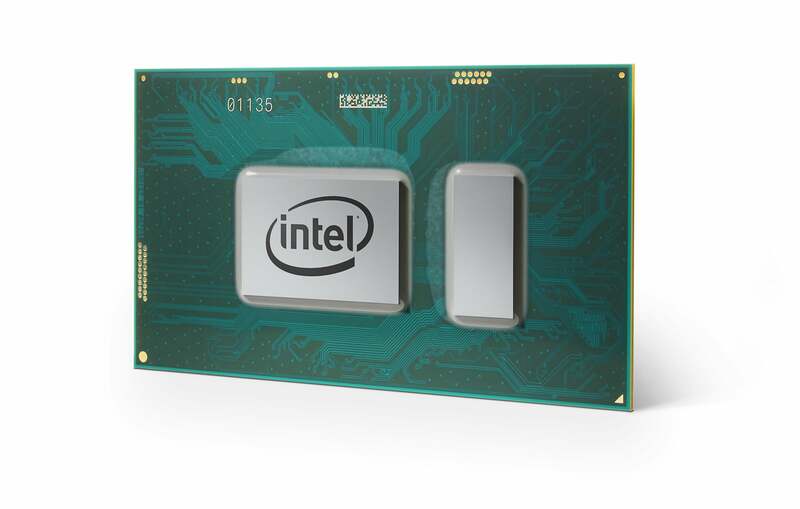 The packaging also confirms what PCWorld and other outlets have already reported: Intel’s 8th-gen CPUs need a new 300-series motherboard to run. 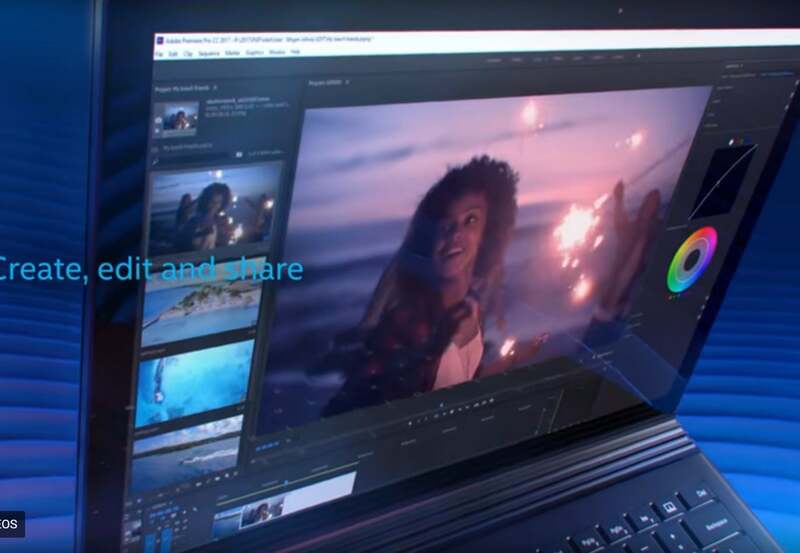 Intel also unwittingly—or not—created a stir when its promotional video included what looks like a black Surface Book. Microsoft’s Surface Book ships only in a platinum color, and though it was updated in 2016 with the Performance Base, the Book still uses a 7th-generation Core chip. Is this the next Surface Book? Could Microsoft be preparing a Surface Book with a Kaby Lake-R chip inside? Intel’s video also says its chip family supports 4K displays, something that the current Surface Book hasn’t quite achieved. So far, Microsoft hasn’t said anything about a next-gen model, but we can keep our fingers crossed. Additional reporting by Gordon Mah Ung and Brad Chacos.